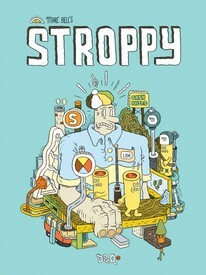 Stroppy is here: it's ALL NEW; it's a self-contained whole; it's by Canadian cartoonist extraordinaire, Marc Bell; it's... a giant-size, full-colour, underground comix classic presented to an unsuspecting [well, not for long] public in the guise of a hardcover graphic novella. Stroppy channels the vigorous populist cartooning energy that can trace its roots back to the classic comics strips – especially the depression-era Popeye by E.C. Segar and Harold Grey's Little Orphan Annie. This vital populism was an integral part of American life and lore, but with the advent of the war economy in the late-1930s, it was sublimated into the national war effort throughout the Second World War, and beyond. While this populist strain of comics did reemerge to a varying degree in some of the post-war, “Atomic Age” comic books, it was not fully reawakened in comics form until the disillusionment of the Vietnam War era. It was then, during the heyday of the underground comix era (roughly 1966-1975), that this same populism reemerged from its generation-long cocoon, metamorphosed and reenergized, and found fresh voice with improved techniques and expanded visual vocabulary. While much of the work of that period was undirected and diffuse, in aggregate there were many discoveries made in the area of organizing information and concepts visually. Yet, much of what that era ushered in subsequently failed to be sustained within the comics medium, and as a result was not incorporated into standard comics usage. Enter Marc Bell. This Ontarian cartoonist/illustrator/collagist/painter has been gradually developing his own unique brand of surrealist/psychedelic comics (aka psychedooolia) over the last two decades. Bell’s work is notably influenced by the early underground comix work of R. Crumb, as well as by the Hairy Who and Philip Guston, all of whom also flourished during the same era. It also has some strong roots in the homegrown Canadian soil of Julie Doucet’s 1980s Dirty Plotte comics, and includes nods to Kim Deitch’s mature works such as Shadowland and Boulevard of Broken Dreams. These influences (and many more, including those of his contemporary comrades in cartooning, most notably Amy Lockhart and Peter Thompson) have all been fully digested and synthesized into Bell’s mature style. He has slowly but surely developed and accumulated an original cartoon lexicon in works like Shrimpy and Paul, Hot Potatoe! and Pure Pajamas. These and many other works were undertaken in the spirit of experimentation, allowing Bell to follow his often inscrutable muse and giving his unconscious free reign in constructing a pen and ink world so overflowing with visual stimuli that it makes Richard Scarry’s Busytown books seem positively sluggish by comparison. Now, at last, in Stroppy, Bell has employed his idiosyncratic arsenal of cartoon creations in the service of a cohesive long form narrative that opens with an incensed populist sentiment that ruthlessly ironizes the blatant inequities imposed by unbridled capitalism, ridiculing both those directing it and those in its thrall. As the narrative progresses, Bell navigates – and, somewhat surprisingly, mitigates – this antagonistic stance through a zany series of nuanced negotiations between Stroppy & Co. and the agents — and lackeys -- of capitalism and popular culture, creating in the process a work that is very much in the spirit offered by the best of the underground comics era, evinced particularly by Bell’s supreme visual anarchy. Anyone reading this who is completely unfamiliar with Marc Bell’s work has probably been having difficulty following the discourse here (but we applaud you for sticking with it!). 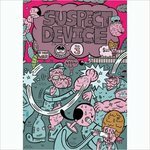 Any of those so uninitiated, yet finding themselves intrigued by the preceding is encouraged to search out examples online, starting here: marc bell comics.